A few weeks ago the beginning of a story popped into my head. I was working on two other chapters for my fourth novel and politely asked it to go away. That night I dreamt about it. The next day it just stayed with me, and I couldn't get any other writing done. Eventually I wrote it down just to exorcise it. Then I thought, hang on a minute, there's something here. I took it to my writer's group and they preferred it to the other stuff I'd given them. So, here's a taster. It follows the adage 'hit the ground running', so that it starts with quite a punch. I haven't yet decided if it is going to be a long short story, a novella or a full-blown novel, but the title is clear to me: Last Human. He woke up running, though he didn’t see how that was possible. He stumbled, but something told him to keep going, not to look behind, so he regained his rhythm and stared straight ahead, arms and legs pumping away, as if he was a pro track athlete. Mustard cones of light sprayed down from the ceiling every ten metres or so onto the slick floor, reflected in oily puddles, while grey soot-encrusted pipes snaked their way along the low ceiling and walls of the grimy corridor, toward a distant yellow glow he somehow knew was his destination. No sound, except the pounding of his feet on the floor, distant thuds and squelches. The air was acrid, a smell like burned matches. There were other noises, he realised, muffled cries, shouts, screams maybe, and something else he couldn’t place, a shrill whine, like a deranged synthetic laugh. Each time he heard it, it was followed by a shout – no, a scream – then more shouting. Part of the wall up ahead on his left exploded, pipes and wires spilling into a mound in his path. Instead of slowing down, his stride lengthened and he vaulted it – hurdled it – and landed hard on the other side. As he did so, something popped in his ears, and he could hear again. He wished he couldn’t. That short whine, followed by another voice, cursing. He increased his speed, the glow getting larger, though he still couldn’t see what it was. Glancing upward he counted ten lights, so he knew it was about a hundred metres to go. A figure of 12.4 seconds flashed into his head, from younger days. Gunfire erupted from behind him, more shouting, more of that grating whine. He burst into a sprint. More screams. Seven lights to go. Wind from an explosion behind him nearly threw him off his feet, and he realised he didn’t know his own name, who he was, who was behind him, and who or what was behind them. The only thing that mattered was running, reaching that glow. His chest felt like it had a brace around it, making it harder to breathe. The air was also getting thicker, and he battened down an urge to cough. He pumped his arms harder, fingers pointing dead straight, stabbing the air. Five lights to go. Several pairs of footsteps were close behind him. The whining noise, and a scrabbled fall. Two pairs of footsteps now, one slowing, turning. The desperate cry was buried under a sound like a jet engine, cut off by that whine. One pair of footsteps. Three lights to go. He could see the source of the glow now, a hatch opening into a small cushioned cell. It looked sturdy. Two lights. He nearly fell at those words, but the whine and a gurgled cry kept him going. One light. He felt he could almost touch the hatch. Pain exploded in his right thigh, stopping it from working; whoever they were, they wanted him alive. But he kicked off hard with his left foot and, using his momentum, crash-rolled towards sanctuary, hurling himself through the hatch, his right shoulder slamming into the cushioned interior. A clunk shut off all external noise as the hatch sealed automatically, followed by a female voice. The single-occupant escape sphere spat away from the corridor. 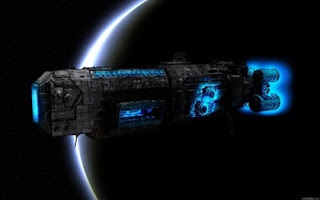 Trembling and grimacing from the burn on his leg, gasping for his breath, he moved to the hatch porthole, only to see that he was in space, had been on one of the new star cruiser models, but it was in bad shape with ripped, blackened metal all over its hull. A pulsing, fluorescent blue mass was attached to the fore-section of the ship; it clearly didn’t belong there, reminding him of a leech. He tapped the porthole viewer to maximum zoom, focusing on the exit to the corridor. Twisted and dismembered corpses flushed into space. But one shape stood at the entrance, a giant, square-headed beast on three spindly legs. He couldn’t make out eyes, but he was sure it was staring at his escape pod, maybe his face at the porthole, even at this distance. 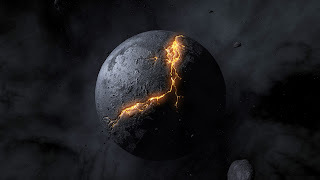 The sphere banked hard to port, and he saw Earth. He slumped onto his knees. Thousands of gelatinous blue amoeba-like ships circled Earth, which was being consumed by rivers of fire, its crust gashed open. It would boil in its own lava.He turned away, sat on the floor with his back to the hatch. President. President of what? But his mind switched to the men who had died trying to save him. They could just as well have saved themselves, they might have been more useful alive than he would ever be. He had the feeling he wasn’t a religious man, but he pressed his palms together and uttered a short prayer for their souls, and all the others on Earth.